Connections is a truly incredible event. Four days in late September will be filled with, as the Connections team likes to say, “inspiration, education and entertainment.” This is the can’t miss conference for digital marketing, hosted by the Salesforce ExactTarget Marketing Cloud, and we want you to be as inspired, educated and entertained as humanly possible on each of them! Here’s a sneak peek at 3 insider tips, but get your own copy for the skinny on all the need to know info to make your Connections experience one for the books! “The easiest way to know what’s going on and where to be. 2) Remember your running shoes! 3) Don’t miss the Cloud Crawl! 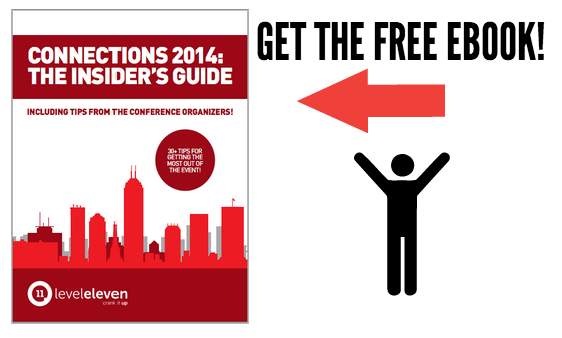 The must have insider's guide to the Salesforce ExactTarget 2014 Connections conference in Indianapolis!